Vagamon, a mesmerizing hill station in Kerala has the power to hypnotize everyone with its natural beauty. It is a supreme backpacker hangout, setting the vista for many thrilling adventurous activities. Even the way to Vagamon is exhilarating with solid rock all around, lined with pine forest. For those who are in search of peace and serenity, Vagamon which is untouched by any modern influences is a perfect frame. Vagamon is a hill station for exploring, with the famous Pine Forests, amazing waterfalls, scenic green meadows, spectacular Vagamon lake, and many other opportunities to make you engage in various activities. 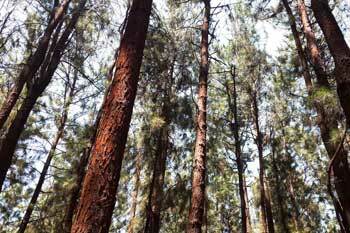 Vagamon Pine Forest is originally a man-made forest and is a major attraction here. It has served as a setting for many movies and is also the photographer's delight. Vagamon is surrounded by tea estates and a long stroll along these tea estates are so refreshing. You can also chill out at the Marmala Waterfall that is nestled amidst thick greenery. Thangal Para is not only a Muslim sacred site but also the most alluring viewpoints of Vagamon. Relax a couple of hours at the barren hills and capture some beautiful photographs. The sight of milky white waters of Vagamon falls falling down the hills will melt your heart. Apart from sightseeing, Vagamon offers daring adventurous activities. Tandem Paragliding is the favourite among the adrenaline junkies. Once you are here in Vagamon, must try Tandem Paragliding and bring out the hidden adventurer in you. Mountaineering, rock climbing, jeep safari are also provided here. Set off to Vagamon and give your trip an adventure twist. Hangout at Vagamon Pine Forest. Thaw your stress away at Vagamon Meadows. Fall in love with the Marmala Waterfall. Get a glimpse of Thangalpara. Spend a romantic evening at the Barren Hills. Take part in some water activities at the Vagamon Lake. Witness a sensational sunrise and sunset at the Mundakayam Ghat. Feel the beauty of Vagamon Falls. Go for a gentle stroll in the Idukki Dam. Don't forget to carry woolen clothes. Vagamon can be visited throughout the year. The temperature during summer (March - June) ranges between 10°C to 25°C, the weather is pleasing and suitable for sightseeing. Monsoon season (July - September) is not pleasant for sightseeing because of heavy rainfall. In winter (October - March), the temperature ranges from 10°C to 22°C and is an ideal time to enjoy Vagamon. By Air :Cochin International Airport is 96.8 Km away. By Train : Kottayam Railway Station is 62.5 Km away. By Road :Direct buses are available to Vagamon from Kottayam, Cochin, Trivandrum, Madurai, and Munnar. You will get fresh tea leaves and spices from Vanilla County Heritage Plantation House. You can shop for natural products such as honey, bee wax, spices as well as your favourite orchid varieties from Vagamon Orchidarium and Floriculture Project.